As a child we all held a crayon or two in our pudgy little fingers, the man that created this piece of art still does. 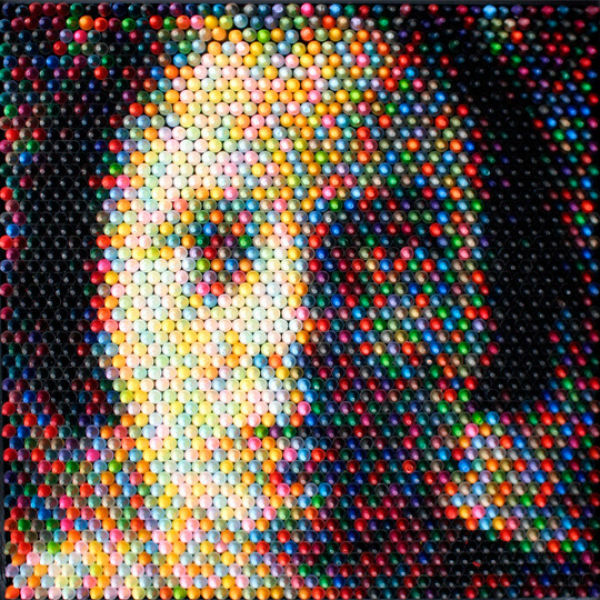 The artist is Christian Faur and he creates art from your average crayon. This is just one of his pieces of artwork, and up close it looks like balls or anti-matter, but if you get up out of your seat and take a few steps back the more distinct and clear this picture becomes, itâ€™s pretty amazing. He states he starts each piece off by taking a picture and scanning it in. Then he blows it up until he has color blocks. That is when he begins to place different colored crayons into a grid producing art like this one. He finishes it off with a wooden frame. He got the idea from watching his daughter coloring with her crayons and remembering how much he loved to color as a child. The smell of a brand new box of crayons got his creative juices flowing. Learn Something Fun: Crayola crayons currently come in 120 colors including 23 reds, 20 greens, 19 blues, 16 purples, 14 oranges, 11 browns, 8 yellows, 2 grays, 2 coppers, 2 blacks, 1 white, 1 gold and 1 silver.